I've made it through another one week quilt challenge. And I'm not even posting about it at the very last minute! There are eleven whole hours until the deadline. This week's challenge was "Carolina Lily." Let me back up a little first. I follow Leasa on Instagram and love her Sew My Stash inspiration. (Side note: I've purchased no fabric in 2017.) 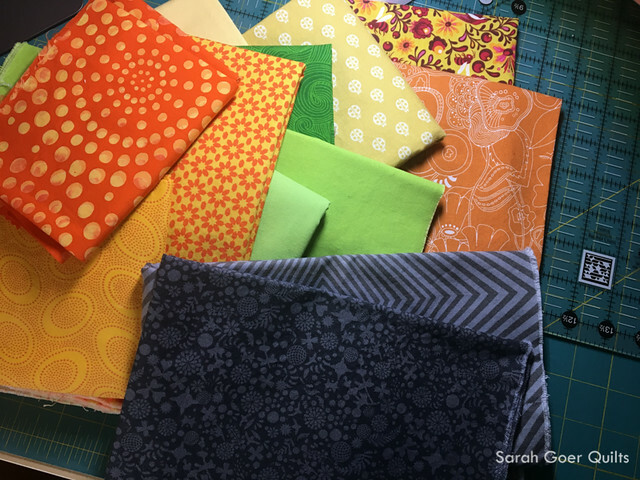 She posted recently about using the good stuff and issued her first 2017 Sew My Stash challenge to use our coveted fabric. So, last week, before the Project QUILTING prompt was announced, I declared that whatever it was, I would use my Tula Pink fabric. It's the collection of fabric that goes most untouched in my stash. Okay, back to the challenge. The Carolina Lily is a beautiful orange flower. It's also the inspiration for a very traditional quilt block of the mid-19th century. First thing was first, I chose some fabrics from the Tula pile. The most obviously chose was this print from The Birds & the Bees. I love that it reminds me of the speckled pattern on the Carolina Lily. I used appliqué in my last challenge and was determined to not go that route this time. 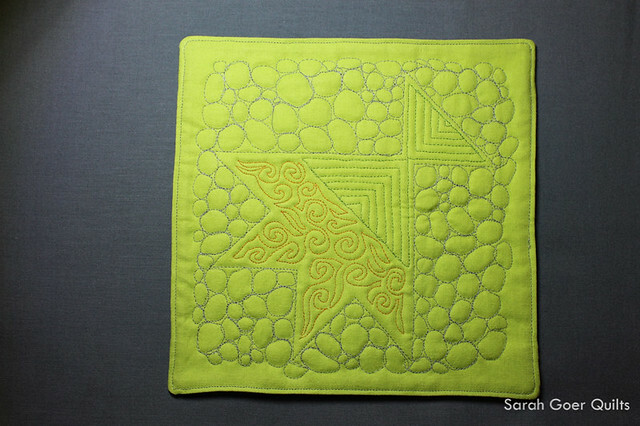 I debated an improv pieced Carolina Lily, but in the end I decided to traditionally piece the block. Except that I redesigned it to only have one tricky inset seam. (Photo below.) Here's my initial fabric pull. 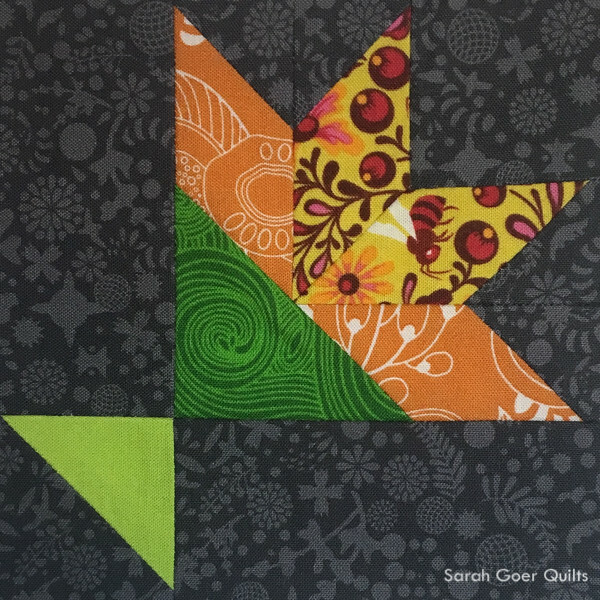 I added some Alison Glass fabrics to the project, because I love her fabric and Quilting Jetgirl is hosting an Alison Glass challenge this month, too! 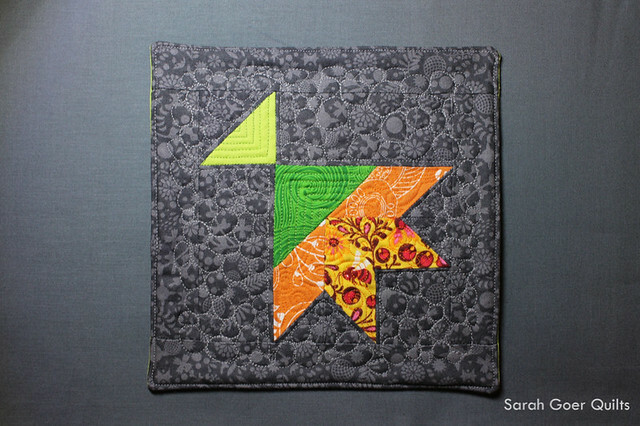 So there we have it, three challenges in one little mini quilt! I would have loved to make a larger, scrappier quilt that encompassed more of these fabrics, but it's a one week challenge and I'm also working on three other quilts at the moment. I had to simplify. My final piece featured two Tula prints (the above print and the green print), two Alison Glass prints (orange print and the grey background) and a Kona solid. My center block is 5" finished. Here's the inset seam and the finished block. With borders the quilt finished at about 7" x 7". 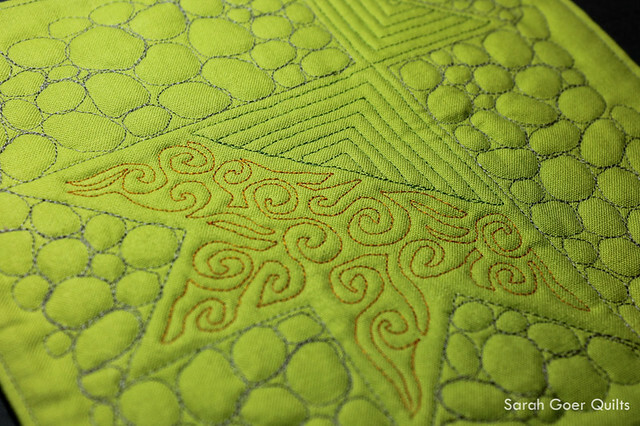 It's quilted with Aurifil 50 wt. #1133 (Burnt Orange), #1114 (Grass Green), and #2605 (Grey). P.S. Three years ago today, I posted my first blog post. I've had such a wonderful time and I've met so many lovely people throughout this journey. I'm celebrating by kicking off my pattern writing business, starting a newsletter, and a couple other upcoming blog changes. Thank you all for visiting! 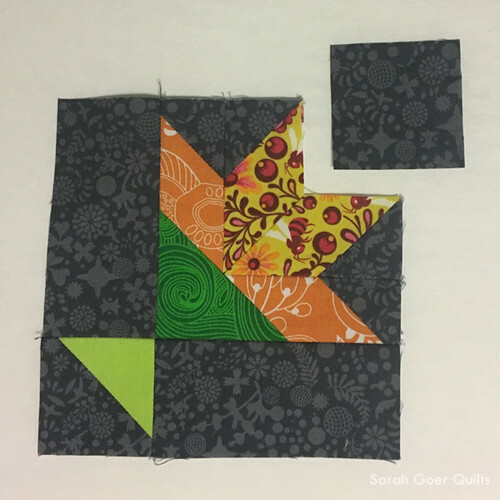 I'm linking up to Project Quilting 8.2, Quilting Jetgirl Alison Glass Challenge, and Sew My Stash 2017 First Challenge (via IG). Posted in Quilting. Tags: Alison Glass, challenge quilt, finished quilt, mini quilt, sewmystash, sewmystash2017, Tula Pink on January 21, 2017 by sarah. I love how the Tula worked right into this project! 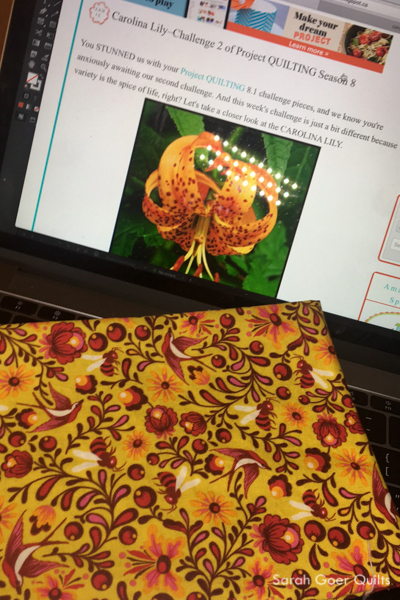 Great combination of fabrics and way to multi-task the project! That's a great little quilt. Good luck with the pattern writing. 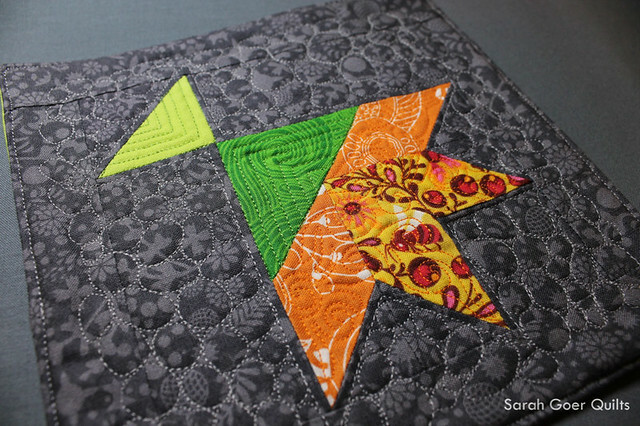 Love the way you quilted this! Happy blogaversary! This is fantastic! 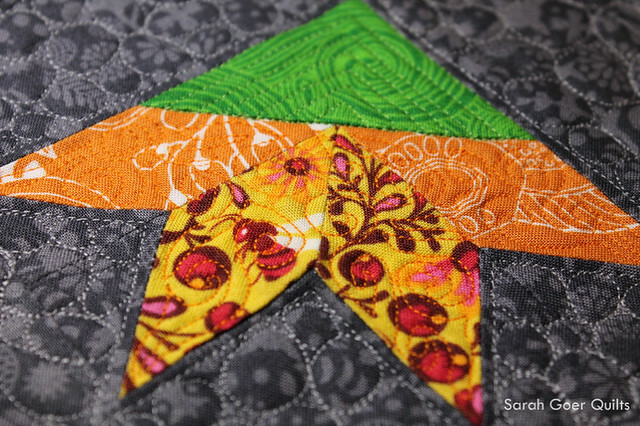 I love a three for one quilt ;) Great fabrics - fabulous quilting! Thanks for joining in on the PQ Fun! Three in one in 49 square inches! It's a tiny little quilt. I'm having fun participating (my first season) and wish I'd jumped in sooner. I've been watching for a couple years. Thank you, Kim! Great mini from your inspiration! I have just recently been using the same Tula fabric. Thank you for participating in the FAL, on behalf of the 2017 global FAL hosts.